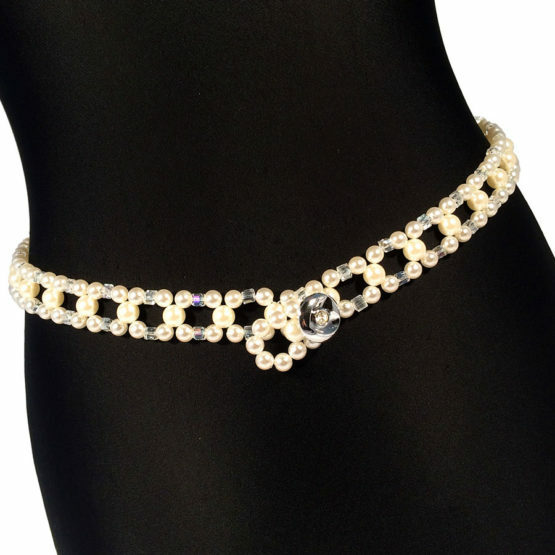 Double row beaded belt in pearl and crystal tones, made with acrylic pearl beads and cubic faceted glass beads with crystal tone reflections. Button clasp in silver tone with a rhinestone in the center. Chain necklace with pearl beads and glass crystal beads. Made with silver tone chain with acrylic beads in pearl tone and with bicone glass faceted beads with reflections like crystal. 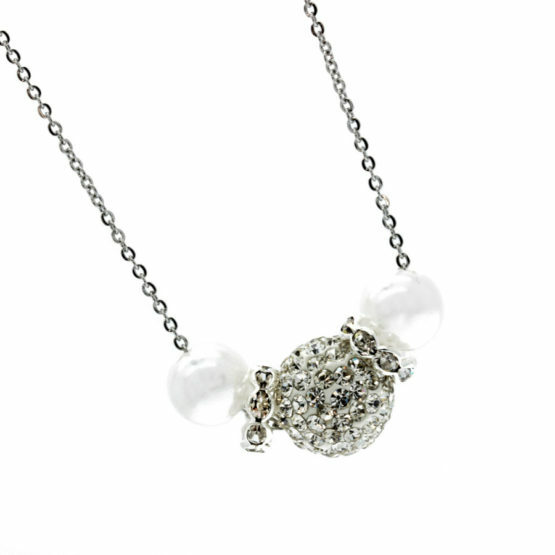 The pendant has a silver metallic base with a pearl acrylic center in the shape of a flower. Earrings for brides, long with pearls and roses for brides. Made with acrylic beads in pearl tone and with cube beads in clear glass. There are also acrylic pearl roses applied to metallic bases. 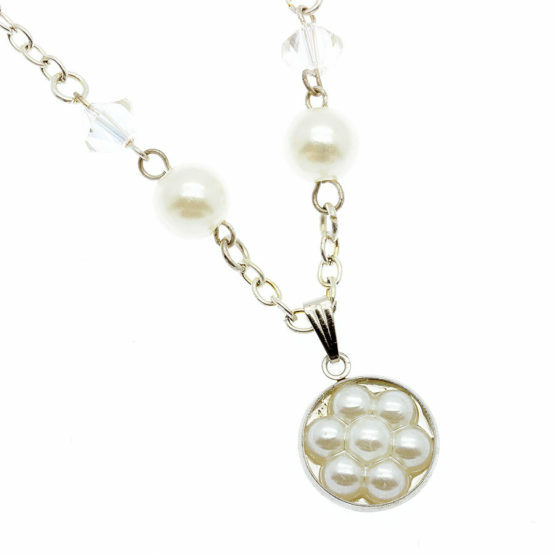 Pearl beads make a pendant in a circle at the end of the earring. 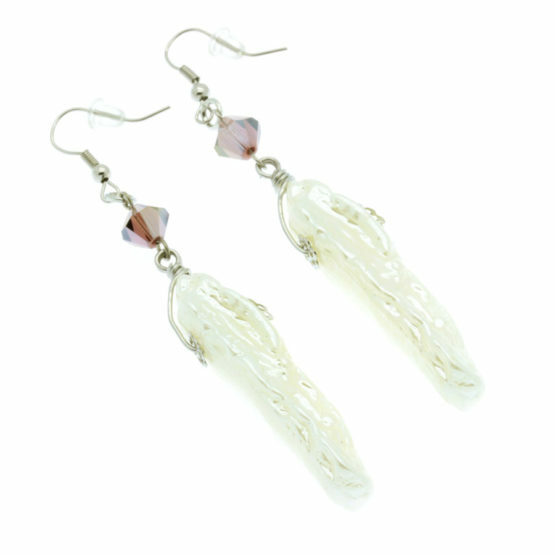 The clear glass beads give glitter and glamor to the earrings. Silver tone structure. Lever clasp. Ideal earrings for brides. Long pearl earrings. Made with glass faceted bicone beads in brown with reflections and with acrylic pendants in pearl colour that imitate natural stone. Long pearl earrings wtith tear-drops for brides. Made with pearl acrylic pendants with tear-drop shape. The final pendants are acrylic beads also in pearl tone and drop shape. They have colorless glass beads above the main tear-drop. 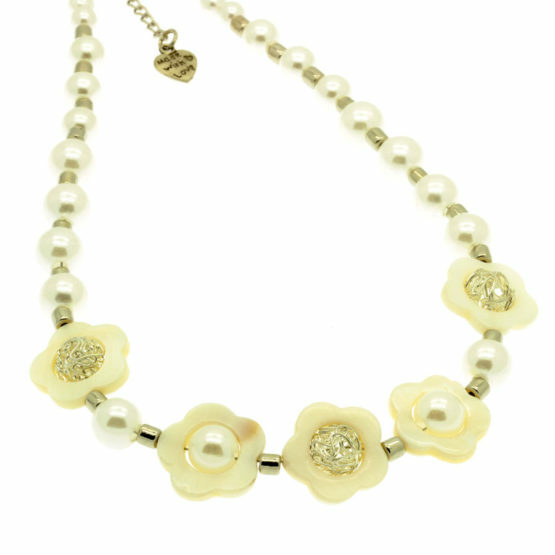 Necklace pearl, white and silver tone with mother-of-pearl flowers. Made with acrylic beads in white and silver tone. 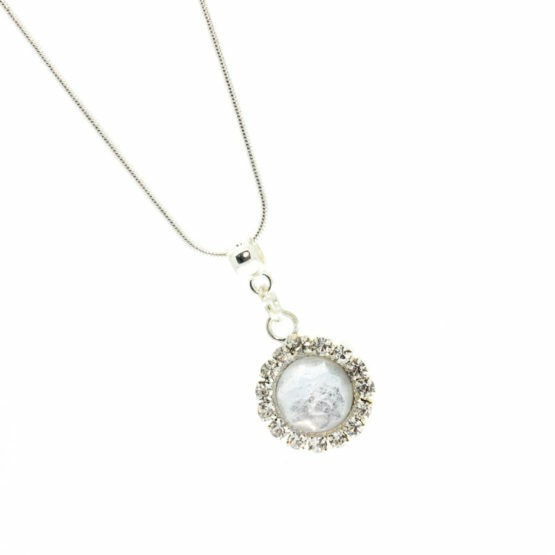 The center of the necklace is made with mother-of-pearl flowers, where white beads and wire beads have been added inside with silver tabs. Ideal for brides. Necklace with a bright rhinestones pendant. Bright silver tone snake chain necklace with round pendant contoured with rhinestones all around. Made with a thin silver tone snake chain. The pendant is made of a silver tone metallic base where a mate application in crystal tone were embeded. It has rhinestones all around it in crystal tone. It is an ideal necklace for the Christmas season by the appropriate shine at this time. It is also suitable to be a bridal necklace. Necklace with bright white center. Stainless steel chain necklace with white beads and a bigger center bead full of rhinestones. Made with a very thin stainless steel chain. This chain does not darken or lose its color. The center of the necklace, in addition to the white beads also has silver tone spacers with crystal-clear rhinestones and a large bead in the center also full of rhinestones. It is an ideal necklace for the Christmas season due to the brightness and color suited to this time of the year. It is also suitable for brides because of the color and the brightness. It's also a beautiful necklace for brides. Necklace with white pearls. 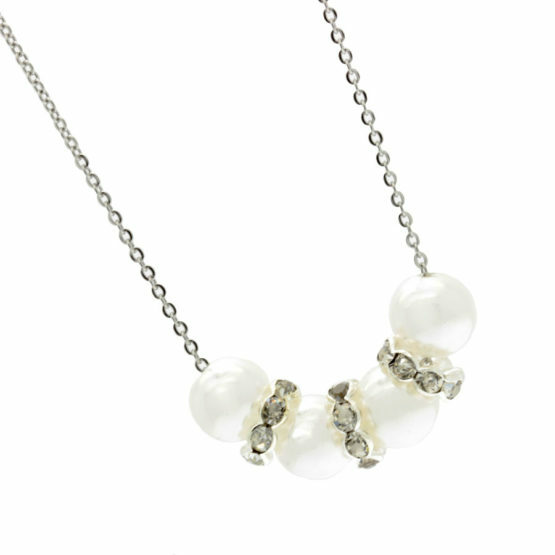 Stainless steel chain necklace with white acrylic beads. Made with a very thin stainless steel chain. This chain does not darken nor lose its color. The center of the necklace, in addition to the acrylic beads in white tone also has silver spacers with bright rhinestones. It is an ideal necklace for the Christmas season by the appropriate shine at this time of the year and also appropriate to brides. So it can also be a bridal necklace. Pearl and crystal bracelet for Brides. Made with acrylic beads in pearl and crystal tone. The crystal beads are faceted having a lot of sparkle and reflections. Ideal for brides. Pearl and crystal bracelet for Brides. Made with big acrylic beads and glass cube beads in crystal tone. 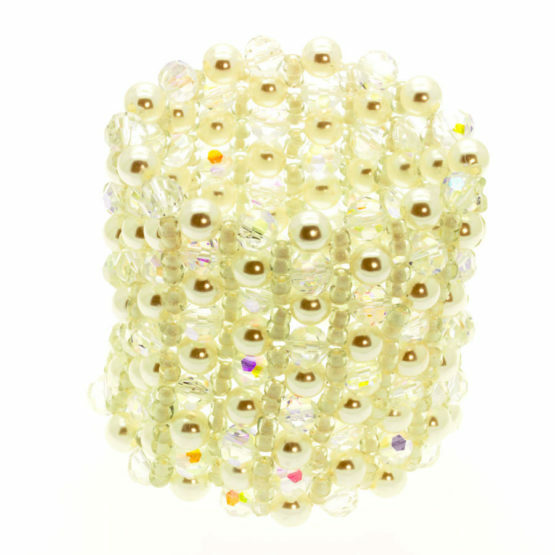 Elastic bracelet pearl and crystal tone for brides. Made with acrylic beads in pearl tone and glass beads in crystal tone. It also has crystal tone seed beads with white inside to imitate glass. Ideal for brides.